So, ich habe mich durch den Ausnahmezustand in den Hamburger LebensmittellÃƒÆ’Ã‚Â¤den durchgewurschtelt, der KÃƒÆ’Ã‚Â¼hlschrank und die Vorratskammer sind proppenvoll und alle Geschenke sind verpackt, das ist schon mal ein gutes Zeichen – LOL! Ok, I made it through this state of emergency in all Hamburg groceries stores (they will be closed tomorrow, monday and tuesday),Ãƒâ€šÃ‚ fridge and pantry are stuffed and all presents are wrapped, that is a good sign – LOL! Weihnachtsjournal – Tag 21, das war Donnerstag – ein Foto wie es an dem Tag zuhause aussah – hahahahaha – das Bild ist noch geschmeichelt, denn jetzt sieht es noch viel schlimmer aus – das muÃƒÆ’Ã…Â¸ ich also gleich mal schÃƒÆ’Ã‚Â¶n machen! 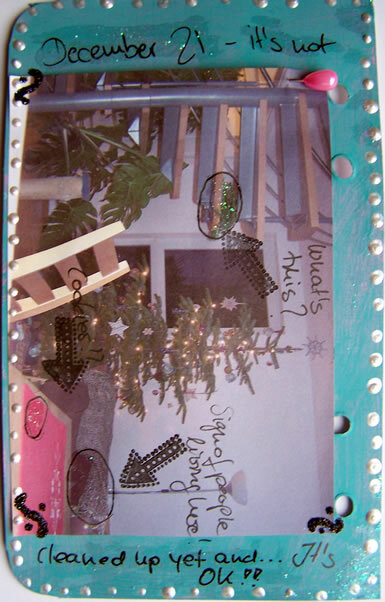 Christmas Journal – Day 21, that was thursday – a photo how it looked right then at home – bahahahaha- that photo is an understatement, because now it looks worse – I have to clean up after my post! Tag 22 – Freitag- was man noch zu erledigen hatte. Nun ja, die Liste ist viel lÃƒÆ’Ã‚Â¤nger, daher nur ein kleiner Ausschnitt – ein paar Sachen kÃƒÆ’Ã‚Â¶nnte ich jetzt wieder abhaken. Hier habe ich Graupappe mit Tafellack gestrichen und mit Kreide die einzelnen Punkte aufgeschrieben. 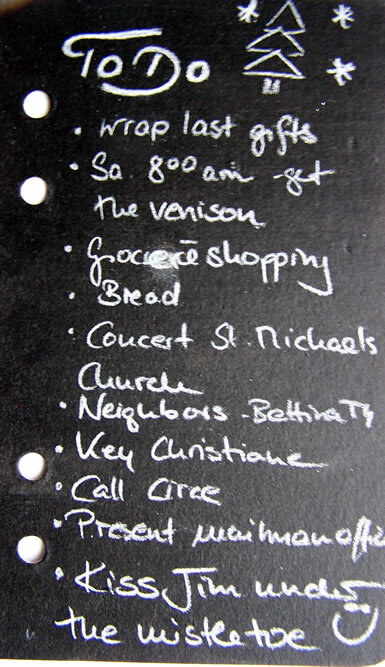 Day 22 – Friday – my to do list – well the list is actually much longer, it is just a small bit of it – on the other hand I can mark some of those things as done. I painted chipboard with black board paint and wrote the task with chalk. 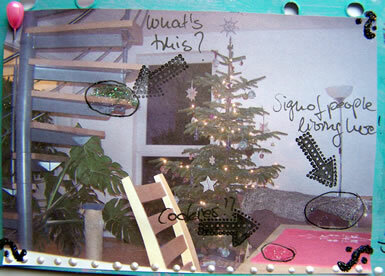 Day 23 – about stockings- a tradition we don’t follow in Germany. We do have St. Nicolaus on December 6th where we will find presents and chocolate in our boots in the morning (if we have been nice – overwise there will be coal in there). 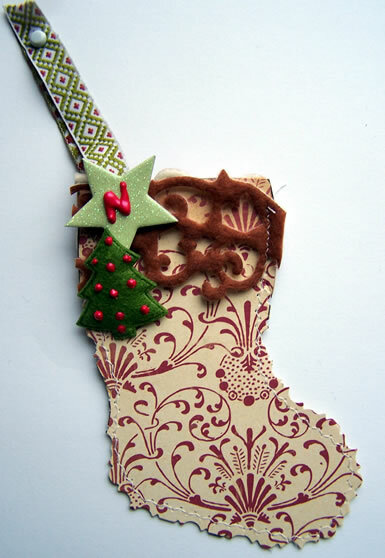 I made myself a little stocking for the book and will add a tag inside with the story about St. Nicolaus. Ich wÃƒÆ’Ã‚Â¼nsche Euch allen ein wunderschÃƒÆ’Ã‚Â¶nes Weihnachtsfest mit Eurer Familie und Euren Freunden! GenieÃƒÆ’Ã…Â¸t die Zeit gemeinsam – sie ist das wertvollste Geschenk! Seid gedrÃƒÆ’Ã‚Â¼ckt! I wish you a very merry christmas with your family and friends! Enjoy the time together as this is the biggest present! Huge Hugs! Hi you! Hope you had a great holiday. Love the pages, especially the stamped arrows. I have those stamps and need to use them more. I also love the stocking. Fun fun! Looks great again! Hope you have (had) a wonderful Xmas! I just so enjoy your journal! Love your Christmas tree, too. They just don’t sell trees like that in the US! They think we all want full, full trees….maybe I should plan to spend a Christmas in Europe…or do it vicariously thru your wonderful journals. Your journal feels like a wonderful holiday gift to me. Love your stocking! I am interetsed to see your journal is in English but you obviously speak english and German. Which is your native tongue? What do you speak at home?